For many years, dachas were the only place where citizens could enjoy privacy from the state. 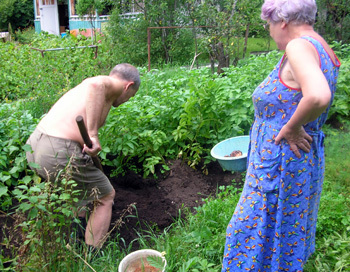 Today, many Russians are putting in lawns, even putting greens, turning their dachas into places for relaxation rather than work. When UC Santa Cruz anthropology professor Melissa L. Caldwell first heard about dachas, the little garden cottages in Russia, she imagined them as a 20th century phenomenon, something from the Soviet era in the 1930s and '40s when shortages forced families to grow food in the countryside. But as she looked further she discovered that dachas actually date back to the early 1700s and the time of Peter the Great. 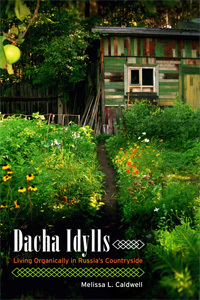 In her new book, Dacha Idylls, Living Organically in Russia's Countryside (University of California Press, 2011), Caldwell writes that dachas began as summer cottages for the upper classes and only later spread to the middle class. Caldwell has been conducting fieldwork in Russia since 1995, studying changing consumer practices in the post-Soviet economy. She visits nearly every summer to look at what people eat, how they decorate their homes, where they go on vacation. The dacha project came about after visits to some dachas belonging to friends. These days, Caldwell visits a dacha in Tver, 2½ hours northwest of Moscow on the way to St. Petersburg. The word "dacha" originally meant "given," stemming from the czar giving land to favored families more than four centuries ago. In the late 19th century, dachas began to mean more than just a plot of land. As tourism grew with the rise of a middle class so grew the notion of getting out of the city and heading to countryside cottages to enjoy an outdoor lifestyle. But rest and relaxation wasn't necessarily the goal. More, it was a matter of connecting with the land. Along with that came a lot of hard work. 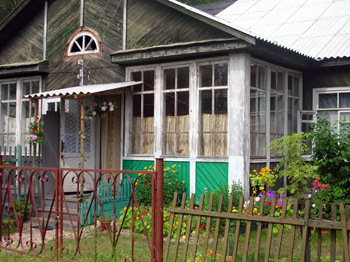 Dachas are a symbolic place of the Russian past and Russian nature, Caldwell said. It's "very much tied to the notion of origins, being rooted and grounded in a larger symbolic environment. Hence dacha activities focus on interaction with nature through gardening, foraging in the forests, and swimming in streams." The Russian concept of the human relationship with nature is different from one commonly held in the United States, she said. In Russia, "humans are not the stewards of nature as they are with the U.S. Nature is the steward of humans." 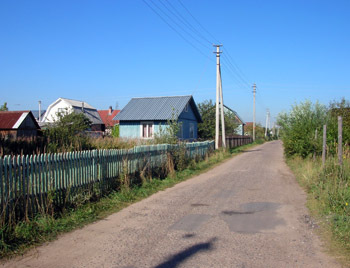 Initially the Soviet government tried to discourage the concept of dachas because of the aspect of leisure, Caldwell said. "The absence of work among the upper classes was a problem," she said. "They took dachas away from the elites, the intelligentsia." The Soviets emphasized them as work spaces, associated with productive activity and labor that would benefit the state, particularly in times of food shortages. They were places to work and relax, though that might sound contradictory. And in true Soviet style there were specific guides on how to relax, the types of naps one could take, and when and how to take a nap. Still, they were the only private personal space people would have out of the view of the state, Caldwell says. Today, Russians are rethinking notions of leisure and relaxation. "They talk about going to the countryside to relax but complain they do so much work there, harder work than their daily jobs," she says. People are beginning to downsize their gardens. They may still grow some vegetables, but now have space devoted to a landscape garden, even American-style grass where they might add a chair and even a putting green. Caldwell said that until 2005, most Russians in their 40s, 50s, 60s would tell her they couldn't wait to get rid of their dachas. They'd want to sell and buy a better apartment with the proceeds. Each year she expects the folks she knows to have sold their places, but so far only one man has. "It a nuisance but you love it," she said.